So glad we can finally make this. I am so looking forward to this. Let’s get started. Jim it is so great to have you here today. J: Thank you I am delighted to be here. P: Our listeners don’t know a whole lot about you. Would you share a little bit about your background and so wise around the idea of time? J: I would have to give a lot of that credit to my father who is an aerospace engineer. We grew up in the Midwest and Midwestern values kind of like Ozzie and Harriet the television show. That allowed me to be a young teenage kid who had all answers and no questions. My father being the wise person that he was he knew there were many more questions and answers. We had lots of encounters growing up. It was good. He was my hero and still is today. When I got out of the army I came home from the army to Arkansas. My father had moved to Arkansas with our family and bought a resort and was going to retire. He figured that maybe I would never have a meaningful job so he started a heating and air conditioning company. When I got out of the Army, Dad said, son you are going to work with me tomorrow. I thought wow, I could stand on my head and gargle peanut butter if I had to for a while. I went to work with my dad and on the way home he told me that I need to prepare for my life’s work. I told him it wasn’t going to be in the heating and air conditioning field and that this was just temporary. I am sitting here how many years later? It was the longest temporary job someone has ever had. It has been good to me and my family. P: Something about maturity, the more mature that we get, the more we realize that there are more questions. We are more curious and know we don’t have the answers. I find also the wiser we get when we start to ask more questions. A good friend of ours Dr. Dunkin talks about the quality communications dictates the quality of our life. That revolves around the quality of questions we have. J: There was a fella named Jones who said we will be the same ten years from now except for the people we meet and the books we read. It does require that we expand and we feel differences and that means that we have to be able to use our time wisely. Time is really a very interesting thing because it really has no definition other than it records the movement of things. It’s us. From the time we took our first heart beat to the last. That is our life span. That is what our time is. As we use that and it becomes a score board that develops who and what we are. P: The measurement of time, right, ok? If we need to meet someone at a particular time, that helps us organize ourselves. Respect each other by being able to use a common language of when we are going to meet. At the same time, it helps us to track the time passing. We can use it as a reflection. A kind of mechanism. J: It has great value in the past. It defines where we came from. Some of the things that we did that we enjoyed and some that we did and would not do again. And so that becomes very valuable. The only time that we are ever going to have is right now. We never are going to have anything but right now. This is really what makes time interesting. I remember as a kid, when I went to school and I was at church, and wherever else, people always told me that we were all created equal. Abraham Lincoln sure did work hard to get that across to the people of the US. I look around and I saw short ones and tall ones and girls and boys and athletes. I saw ones that could learn fast and people like me who struggled a bit more. There isn’t anything but equality until finally it came to me. The equal thing what we had was time. We are all different. Our fingerprint is our serial number and we all have a different one. We all have different talents. What do we do with our time and talent to determine the outcome? P: That is an interesting way to look at that. We are all different. What makes us really who we are is what we do with our time. J: Our energy level that accelerates the movement. When you are looking at time especially with the emphasis on productivity. You have a specific goal or should have and you are tempting to change what you now have into something else. If you were totally happy with what you had, there would be no need for change and the world would grow static. But because we strive for productivity and strive to be better and have more meaningful relationships. To make more money and power and love in our life. More respect in our community. Whatever it is that we want to be more productive in means we are dissatisfied with where we are. We need to have a roadmap and a scoreboard and an energy level of how we are going to get there. P: Maybe we are satisfied with where we are but we have ambition to create even more or to see because if we don’t, typically when people don’t do anything, then what happens again, that word time comes in, we are guaranteed with time that things will change. If we don’t create the change with ambition, then time will create the change. Economic or natural disaster type of challenge. J: We are either driving or being driven. Time has no respect for people. We all have the exact same amount of it. When our amount of time has been used up then that is all we are ever going to have. If people could save time or could have done something different with their time, then I am sure the graveyards would have fewer people in them that they have now. All we can do is use what we have. We really can’t control our circumstances totally. But we can control what we do with our circumstances 100%. What are we doing or what do we want to do. We just want to increase our worth, change it, make it different, follow a map and accomplish something that we now don’t have and want to expend the energy to get. P: Such an important part of where energy comes from. Energy management is the thing that is more important than time management. Controlling what we do with our circumstances is dependent on where we focus our energy. That is what controls what we do with our circumstance. Focusing our energy in negative directions will yield certain results. The same kind of person, like Nelson Mandela who was jailed for his beliefs and what not, he could have created aggression and anger and done that with his circumstance. But instead, he learned the language of his suppressors and not knowing if he was going to get out or not but prepared for it. J: Your circumstances are not always circumstances that other people can see. We all have a great deal of ability to think more thoughts than our voice can speak words. That gives us a whole lot of room for personal self-talk. Self-talk which generates a reason to continue with excellence or tries to cover up why things did not go as well as they should have or could have. It’s a protector for us. It’s something that we can control ourselves that nobody else sees. We can’t be criticized for it because nobody knows about it. That is the biggest killer of productive time management. Simply because it usually takes us places that we know we have already been and tries to justify them or it isn’t a movement toward where we really want to go. Controlling our own mind is incredibly important with time management. P: It’s that inner critic, even though it’s there to protect us, you are either giving in to that voice or the questions, right? It’s not asking quality questions. That inner critic might say, what is wrong with you? You are trained to come up with an answer and it’s going to bring up a negativity. It can lead us down a path that may kill our productivity or psychology. As opposed to the other voice inside us that gets drowned out. That other voice. That Ying and Yang. The positive side of things that says yeah, but look at things like this. There is always another perspective. It’s our choice as to which voice we listen to and what kind of quality questions we decide to ask ourselves. J: It is a choice. Life is nothing but a series of choices providing that we have the talent enough to use our conscious mind. I am sure there are poor individuals that were given so little talent that they were given few choices. Simply because they couldn’t discern one thing from another. That is the way we were when we were first born. As we grow and learn and we begin to see that making choices can take us where we want to go. Then it becomes very important that we use our choices in an effective way. Which takes us back to time and a scoreboard. No one would watch a football game if the scoreboard didn’t work. You couldn’t remember who did what. If you could get a first and five instead of a first and ten, it wouldn’t be a very interesting game. If everybody sat down and ate s’mores and sang songs it probably wouldn’t have the same effect on Monday morning and the critique comes about. Crosby Stills and Nash sang The Southern Cross. The last bridge is incredibly interesting and one of my favorite pieces of music. We trusted and lied, we lied and trusted, we never failed to fail and it was the easiest thing to do. Failure is simple, success is difficult. P: What makes success difficult? J: Success is exceptionally difficult because if failure is easy, that’s the Yen. Success therefore, is difficult because if you took the easy way, you would fail. Success is a driver of a series of quality choices that you make one after another. That takes you to a goal that you are looking for. And failure is requires nothing. You can just sit right here and fail. Do nothing. You can do nothing and fail. You can blame yourself if you want to and fail. Anything negative is going to stifle creativity. Creativity only works on positive vibes. It has to be happy. The beautiful thing about our minds is there is more than one level. We have a conscious mind, a sub conscious mind and a reactionary mind. We can bounce around between those as we wish, the thing of it is is the unconscious mind or the sub conscious mind sounds to be the one that would have the least whatever. It’s the most difficult because the other two have to be at peace for it to work. You can’t be in turmoil and have your subconscious mind work. It doesn’t and can’t operate that way. It’s looking for peace and tranquility. I promise you when that football player made that play that was beyond anybody’s imagination, he was in the zone and his mind wasn’t thinking negative thoughts. The car driver that went faster than everybody else was not sitting there worrying about negative things. All of the positive and productive things that we want come from peace. Not chaos. P: Inner peace. Some people use congruency. In line with our values and desires and that feeling of gratitude. All we have is time and it’s right now. That is also one of the greatest ways that people get into the flow by being completely present and seeing themselves achieving what they want to achieve. Being in balance while being present. Does that make sense? J: When you are present, you are focusing on something that you are asking your mind to give you. Whether it’s the ability to hit a baseball or many times when you are speaking or writing. I am sure you have been speaking to your clients and when it was all said and done they came to talk to you and they had a much better idea of what you said, than you did. P: yes! It just flows and it’s completely present. J: Even though you didn’t totally control your conscious mind, your subconscious was being employed. What comes from your subconscious mind, because it’s not messed up with choices, it is a slave. It is your slave. But it won’t work until it has all of the ingredients correct. When you ask it to work, then at that point, whatever it produces is absolutely perfect. The right time and the right inflection. The right everything because there are no choices. Its perfect information that you have stored over your life that you are now sharing giving away, if you will, to those around you which is probably the finest gift that anybody could give anybody. The gift of their pure essence of themselves. P: When you accept the moment, even if it is not peaceful in nature, just accept it and time goes away. Time goes away. The whole idea of measurement of time, it’s amazing how much dedication and energy has been put into correcting clocks and getting them down to precision on the internet. J: I want a scoreboard that works. If we are going to play a game, I want 60 minutes. Not 40 not 70. That’s very important because a good high quality scoreboard that is equal to everybody and works the same. Time is like the commercial that was on a few years ago where they had the Wells Fargo guy pushing a pallet full of paper money on a pallet into a vault. The caption for the commercial was there is no shortage of money, however, it doesn’t come with instructions on how to use it. There is no shortage of time either, there is just no instructions on how to use that as well. It is very interesting and equal on one side, but it produces inequality in all of us. We strive to be better and have more and to want more. We do that for ourselves and we double down with our children. We want them to succeed as well. We want to leave the world a better place than what we found. P: It’s time for us to take a short break. We are having wonderful important conversation around time and productivity. Stay tuned. I am speaking with Jim Brown about time. This is Penny Zenker with Take Charge of Your Productivity. P: We are back. I am Penny Zenker. Today we are speaking with Jim Brown. This is our second segment. He is going to share with us his views on productivity and how he defines it and what the x factors are. Welcome back Jim. J: The ability to get from one place to another efficiently. If you don’t want any change, if you are satisfied with where you are, productivity is pretty meaningless. Productivity means that you desire things to be different than what they are not saying that they have to be bad. Not saying they have to be painful. They can be wonderful but even more wonderful is better than less wonderful. Moving towards that is productivity. The more efficient you are, the ability to listen takes you to productivity. Your ability to teach is done with speech. Productivity is strictly 100% a factor of your ability to hear listen and learn things that you didn’t already know and apply them to a task that you specifically want to achieve. P: In a football game, you want to have a way to record it with a scoreboard. I am not sure about your reference to show the achievement. Can you address that again? J: You have to have a specific amount of time to be able to determine who has championed the event. If a game had no specific amount of time then the first person that scored could win. It takes the whole game to determine who the real winner is and why. P: Time kind of helps us to define the rules and set the boundaries? The other thing I heard was that it also provides multiple chances so that there is an excitement of building on itself. J: It also gives us the ability to forgive ourselves for things that we didn’t do if we are striving at the best that we can so that we don’t have to swill on all of that guilt. We can move forward to achieve the goal. We don’t have to get it the first time. We would love to start ahead and finish ahead. Many times we are born out of earlier failures. To be able to get through that gives you such a sense of accomplishment because it wasn’t easy. It was something you were able to do that made you feel terrific because you knew that you didn’t get it handed to you on a silver platter. You had to get in the grip and dig and try and come up with a result. If you didn’t get it the first time, then ok there is a second and a third. Maybe a fourth. Colonial Sanders was supposed to have failed so many times before he finally got the recipe for chicken that made him world famous. P: He got turned down many times. Yes, I have heard that. I got it now. The scoreboard sets the rules and boundaries and creates a challenge, time gives us the element of challenge, through it , it allows the learning and application and the one that becomes the winner is the one who learns and applies it in the most effective way in that time frame. J: That is a perfect definition of productivity. What we do with what we have within a time frame. If we were asked to recite the Gettysburg Address and were given six months to do it, it wouldn’t have the same effect that it did went Lincoln spoke it. Everything works together. I see productivity being a three legged stool. First is time. The scoreboard. Second, is the ability and talent. Third, is energy. And that energy part is its incredibly interesting because we control that. The other two, not so much. P: With our physical body and our psychology. One can affect the other and both can have a huge impact on the other. J: They sure can. And they do. The people that you see that are the most prone to smile are ones that you look at and say my goodness, these people are busy, busy, busy. They are doing something every minute of every day. They are doing something useful. They have that inner peace. A forced smile makes you look like Alfred E. Neuman. A non-forced smile could make you look like Cary Grant or someone with a nice personality. Because it looks natural. It fits them well. P: You have said, energy uncontrolled has no value. Tell us about that. J: Energy uncontrolled is a total waste because it accomplishes nothing. Somebody wildly flailing their arms or raving on about something that has no meaning or context. You look at this and think, well, they got a little benefit from this for the exercise value, but outside of that, there is no meaning to themselves or anyone else. Energy, in order for it to be used properly, it has to be able to be used improperly. The only given thing in this whole conversation that we have is time. It is a given. Everything else has variable to it. Energy has to do something. It has to change something. It moves things and makes things happen. If we didn’t have energy and if things didn’t move, ability and time would be completely useless because they would have nothing to do. P: I agree. Uncontrolled energy just burns out. That is where my metaphor with the windmill came from. And the three different segments. Fuel it, direct it and then sustain it. J: We will always have time where we need short bursts. Things really need to happen. Like a boxer who is out there and needs to pay attention to what he is doing in the ring facing an opponent. His ability to be a good boxer is predicated on the hours that he runs and the shape he gets into. The amount of energy he expends at the time of the moment, it has to be at maximum, and the energy and the time and effort he spends while he is preparing to provide himself the tools to be there, they need to be sustained. If he trained for ten minutes as hard as he could then quit, he probably wouldn’t win. P: Where do you see discipline coming into play? J: Discipline has to be a function of talent and energy management. As your talent grows, your choices and options grow with it. So as you get better and better and better at anything, you either focus inward for a particular goal or you have a wide variety of things you can do outside of it. Discipline is the road map. It takes you from point A to point B. We are all going to get off of it a bit, but the most disciplined people will follow the straightest line. P: Time, ability and energy. Another question I ask everyone is what is the x factor that you think is there in productivity? J: The energy is what you control. And energy really gets into a myriad of subjects that are interesting like emotional energy, physical and mental energy and the discipline would be management. The management of all of these energies that are going to be put together to make it go, the thing that makes energy so interesting is that we control it 100%. Mental ability can be grown to a certain degree. There is an end to it. Hopefully most people have so much of it it’s like a computer. But there are some on this Earth that do. Those people show you what that end of the spectrum is and people that are genius level, show you people what the other end is and then we are in the middle. I am in the middle. My ability to get from where I am to where I want to go has to be driven by my level of energy. P: The first step for many people is to start understand the concept of energy management. In order to make a change or improvement, the first thing that has to happen is to gain an understanding. Educate yourself. How do I do this? What is it? That is why I created this ten elements through all of my experiences. Purpose, Language, Focus and Physiology. How do these 4 things interconnect into areas such as strategy? Energy flows throw everything. In order for people to take the next step in terms of managing or controlling energy, they have to understand what kind of language to use. Otherwise, it’s very broad. J: That is correct. One of the reasons why productivity and time management are so difficult because they have so many competitors. So much competing for your time and attention. There is another big word inside here that means a lot to me and that is desire. What do I desire? What am I willing to give up my time for to generate energy into what am I willing to put myself out to do? That is defined by my desires or lack of them. It’s very important that there is passion. It’s like if Pepsi didn’t have any fizz nobody would drink it. P: The fizz is the passion? J: Fizz is the passion. In relationships and all kinds of things. P: It’s an important element. That is why the first element I have is purpose. Within that purpose there are a couple different elements that when you combine them together you get that passion or desire. Right now we are going to take a break then come back and talk about the aspects of environment and culture. Stay tuned as I talk with Jim Brown. 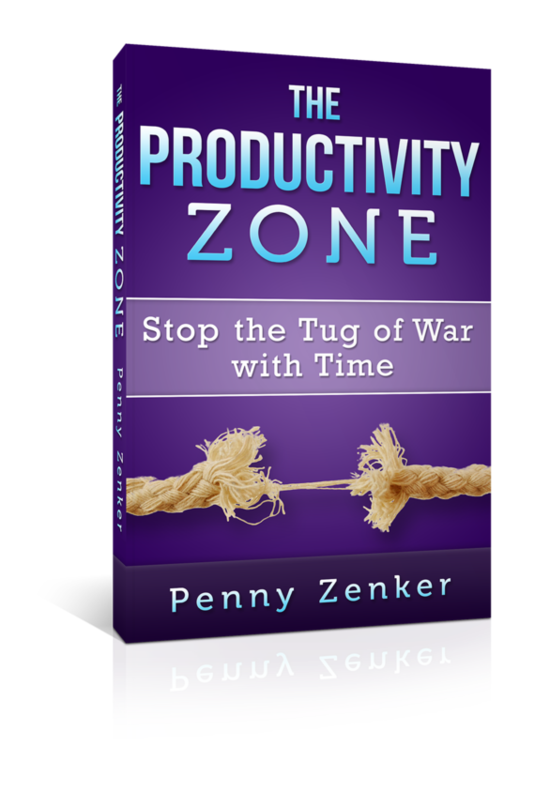 This is Penny Zenker with Take Charge of Your Productivity. P: We are back. I am Penny Zenker. Today we are speaking with Jim Brown. This is the third segment of discussion of time, productivity and understanding how it all fits together in the scoreboard. Now we are going to talk about the environment and what role it has. Also culture and how it affects our productivity. Welcome back Jim. P: I lived in Switzerland for 16 years and it was interesting to see the cultural aspect of time and productivity and how people view these concepts in a totally different way. I really believe culture and our environment plays a big role. I saw how different it is from American views. In Switzerland, people would always arrive on time. They are very timely, the trains are on time, and everything is about precision. They always left work on time. Perfectly on time. Something you don’t see here. If there train is coming at 5:15, they bolt out of the office by 5:00. No matter what is left unfinished. Americans tend to have a different sense of urgency regarding time. Things need to get done and done now. What do you think creates this cultural gap around time and urgency? J: I think a lot of it has to do with the educational system in place in Europe. It’s much more formal. At an earlier age, children have to decide how they want to proceed with their education as their life progresses. If a child wants to go onto secondary and post-secondary education, they are going to have to show aptitude toward that at an early age. Then they will funnel them with other children who are likeminded and they will progress and go. Whereas the US, we are still young enough and naive enough to where we think we can double up and catch up or whatever and we don’t have the discipline.